I used to do all of the cooking most nights, and if Dave ever offered to help it was to make a meal. Then, I started writing a food blog, and Dave started helping me in the kitchen. 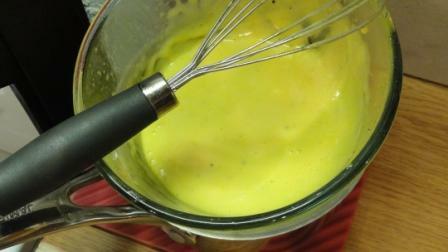 If ever I made a Hollandaise sauce, it was using a cheat method with my stick blender. 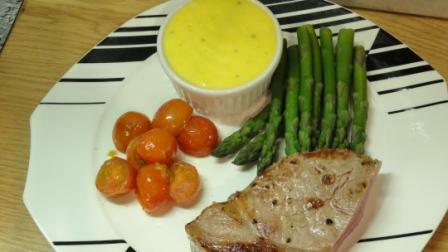 But now that there are two of us in the kitchen, I could leave the cooking of a perfect steak to Dave while I whisked away at my Hollandaise sauce. notice my very special whisk – I found this in Australia and if you ever come across one, get it – it is wonderful to work with as it acts as a spatula at the same time. Steam your asparagus, making sure you do not leave it in the pot for too long – you want nice crunchy asparagus stalks which according to etiquette rules, you eat with your fingers! I’ve never made it before.. you have now inspired me ;). the weekend has been awesome. We had perfect beach weather yesterday for the family! it is a perfect sauce! So far weekend has been awesome. Have had my Aussie family with me 🙂 Hope yours was stunning! Ha, I bought some asparagus yesterday and was considering making hollandaise, but decided it was too much effort last night, maybe you’ve inspired me to give it a go today!